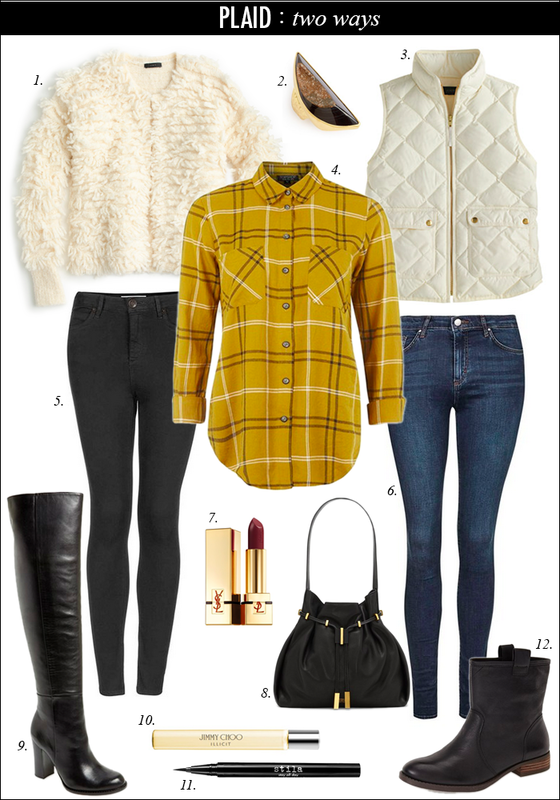 Plaid is perfect for fall - here are two styled looks. This post makes me so exited for fall! I love your day to night styling. Thanks, Heidi! I would love to get that shaggy coat. I love plaid!! So excited for fall. I love the idea of pairing a fuzzy sweater with it. Thanks, Amy Ann. I love plaid a little too much lately. I am so excited for fall pieces, that purse and those OTK boots! I am so glad OTK are still in style. Thanks, Chelsea. cute post! fall time clothing is the best! Fall clothing is the best! Thanks, Kelsey. Both of these looks are perfect for fall, and I love the colors in that plaid top! Plaid is definitely one of my favorites for the fall,too, I really like both the ways you styled that shirt. I cant wait to bust out the plaid! Both of these looks are fabulous! Sam Edelman 'Rylan' Over the Knee Boot is such a nice item! I'd love to have them for winter. I love layering Plaids with a sweater too and you nailed the look. You look great ! Plaid and boots are my favorite, too! Thanks!